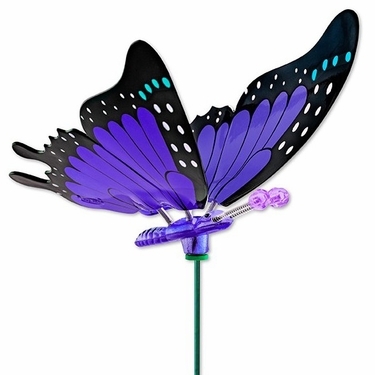 If you enjoy colorful butterflies and whimsical decor, you will absolutely love the whimsical fun of our fabulous new 11" WindyWings Butterfly Garden Stakes! Fluttering from the same family as our 4" & 7" WindyWings Butterfly Stakes this new butterfly assortment offers the same butterfly beauty in a Large Magnificent Size! After 8 years of requests for a larger size, here they finally are! Each 11" WindyWing Butterfly is made from an ABS plastic UV treated, and finished with a lacquer coat for added durability and shine. Each detachable garden stake is made of a flexible 25.5" Nylon Rod. These Monarch style Butterfly Garden Stakes by Exhart are truly a joy. The patented "springed" wings design allows the butterfly wings to actually dance and flutter in a wind! Transform any blossoming plant or garden bush into a butterfly flower garden with these playful butterfly decorations hovering all around. The color will pick up sparkles in the sun, and smiles for all your garden visitors! What could bring more joy than a beautiful butterfly fluttering around your garden!? Our WindyWings Butterfly assortments contain only the most precious and delightful colors. Every time you see one, you'll think of all the beauty in the world. A great way to enhance butterfly gardens! Each Set of 4 Butterflies comes only in assorted colors and will include a purple, red, blue, and green butterfly. Save 15% instantly using coupon WINDY15 when you purchase 3 or more sets of these Large 11" Windywings Butterflies! A youthful delight to any Butterfly Garden!